For a smart casual ensemble, make a NEON ROSE collared coat in faux shearling and a white wool midi skirt your outfit choice — these two items go beautifully together. To bring out the fun side of you, finish off your ensemble with tan leather knee high boots. For a smart casual look, consider teaming a NEON ROSE collared coat in faux shearling with black leather skinny pants — these items fit perfectly well together. For shoes, rock a pair of black leather pumps. For a smart casual getup, try pairing a NEON ROSE collared coat in faux shearling with black leather skinny pants — these two items play really nice together. Complement this outfit with black leather lace-up ankle boots. For a smart casual ensemble, choose a NEON ROSE collared coat in faux shearling and a white wool midi skirt — these two pieces play beautifully together. For something more on the daring side to finish off this ensemble, opt for a pair of tan leather knee high boots. Wear a NEON ROSE collared coat in faux shearling with light blue ripped boyfriend jeans to be both cool and relaxed. Amp up the cool of your getup by complementing it with purple embellished suede pumps. 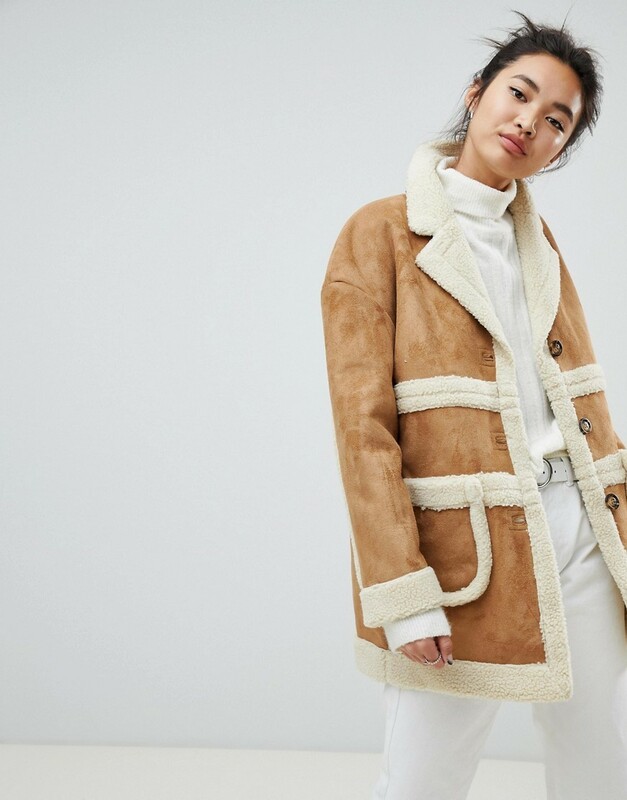 For a smart casual look, marry a NEON ROSE collared coat in faux shearling from Asos with a black turtleneck — these two items go really well together. When it comes to shoes, this ensemble is finished off nicely with dark brown leather ankle boots. If you're scouting for a casual yet chic ensemble, go for a NEON ROSE collared coat in faux shearling from Asos and light blue skinny jeans. Both garments are totally comfy and will look fabulous paired together. Black leather ankle boots complement this ensemble quite well. If you're on the lookout for a casual yet totally stylish getup, make a NEON ROSE collared coat in faux shearling and blue ripped skinny jeans your outfit choice. Both pieces are totally comfy and will look fabulous together. Break up your ensemble with more casual shoes, such as this pair of pink low top sneakers. 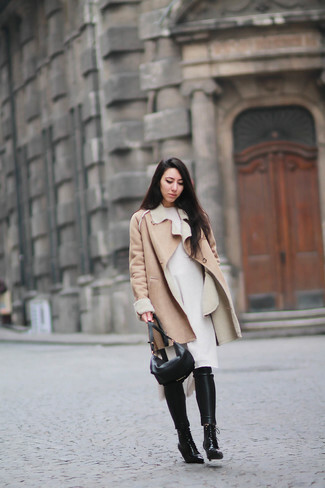 If you're on the hunt for a casual yet absolutely chic outfit, wear a tan shearling coat with black leather leggings. Both pieces are totally comfy and will look fabulous together. Bump up the cool of your look by completing it with black leather lace-up ankle boots.